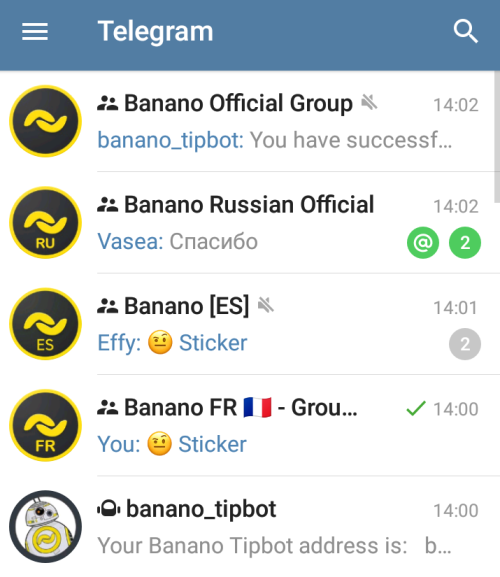 We have just officially launched our BANANO Telegram Tipbot, and also new official BANANO Telegram Groups in several different languages! You’ll find the list of all new groups further below. Join us for the Tipbot Release party! Everyone is welcome! If you don’t know BANANO yet: BANANO is a feeless, instant, rich in potassium cryptocurrency powered by DAG technology to disrupt the meme economy. BANANO is a fork of NANO, but we added memes, free distribution with faucet games, monKeys, the slickest mobile crypto ever (Kalium), and lots of other cool stuff! We’ve also had active and successful BANANO tipbots at our Discord and subReddit for quite some time already. 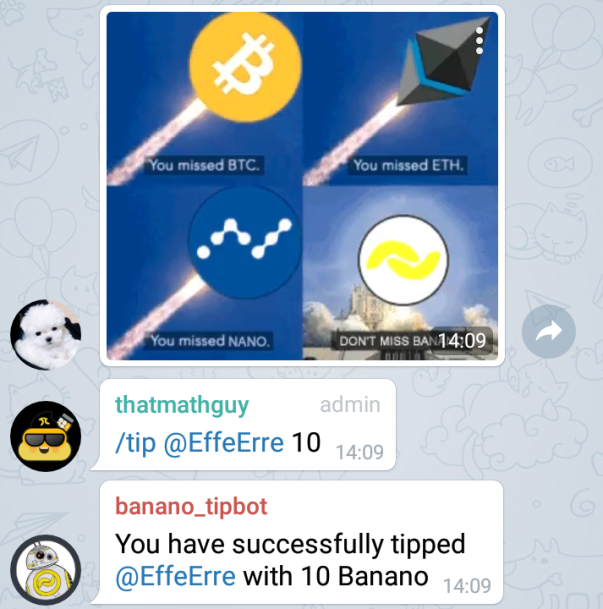 Now, we have added a Telegram Tipbot to also include Telegram users in BANANO’s free & fair ongoing distribution ecosystem. And at this occasion, we also created several fresh groups for users preferring other languages! Where to find the groups and how to get started? You might realize that now, since Kalium with its paperwallet claim feature is out for both Android and iOS, we are prepared to increase BANANO distribution also in the real world, to people who are not into crypto at all yet! To make sure we can help folks getting started in all languages needed those groups and our dedicated mods and community will make an important contribution. Note: Please refrain from directly asking for BANANO, since we have a strict no-begging policy in all our channels. If you show interest in BANANO there’ll be tips coming to you, no worries. Update Feb 19th, 2019: Unfortunately there are issues with the current Telegram Tipbot. Please withdraw your BANANO from the bot, we’ll check and come up with a solution hopefully soon. Please follow announcements.